SharePoint hub sites are a long awaited feature where by your Office 365 SharePoint Online communication or team sites can be associated to a hub site and inherit the navigation, theme and logo of the hub. This provides a consistent user browsing experience for all of the associated sites without performing configuration on a site by site basis. The more valuable features in my opinion are the roll up capabilities. For years now, I would have to build this type of capability for my clients which requires server/client coding, search queries, custom or out-of-the-box content query/search web parts to provide site/content querying capabilities across all of their site collections and sub-sites. Now, this new hub sites feature automatically provides capabilities to roll up information like site activities, news aggregation and search aggregation up to the hub without any coding. SharePoint hub sites were first introduced at Ignite and recently Mark Kashman from Microsoft announced that they are being rolled out to Office 365 Targeted Release customers. Since that post and in the Office 365 Message Center (MC131852) , Microsoft have announced that they plan to have hub sites rolled out generally in May and they are now fully rolled out to customers who have enabled targeted release features. This post will show you how to provision a hub site using mostly GUI capabilities. For more detailed information, refer to the Microsoft published Create a hub site in SharePoint Online article which also has steps on how to script the hub site provisioning & associating using PowerShell and site scripting. 1. Start by using an existing site collection or creating a new one from the the SharePoint home page which is accessible via the app launcher (ensure that it uses modern team or communication site template). Note if you create a site from the screen below, it automatically creates a mail enabled Office 365 security group which is needed in the next step. 2. 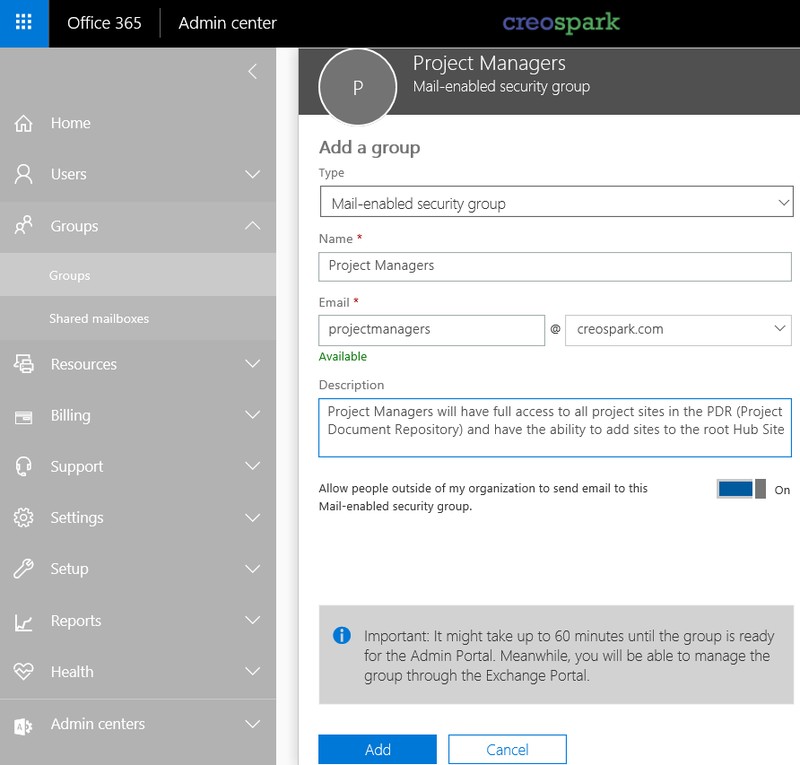 Use an existing Office 365 mail-enabled security group created by your users or have IT create one in the Office 365 Admin center –> Groups section and add the users you want to be able to associate their sites to the hub. 3. As an elevated user (i.e. an Office 365 global tenant or SharePoint admin), ensure you have the SharePoint Online Management Shell downloaded and installed on your local client system. Register-SPOHubSite "<URL of the site collection that you want to be the hub site>"
6. Use the following PowerShell command to give members of the Office 365 group you have already created, permission to associate their sites to the hub by entering parameters with the URL of the hub site and with the email address of the mail-enabled security group. 7. At this point, your hub site should be ready to go! My next post will guide you through the settings of a hub site including setting the theme & uploading a logo as well as how to associate a site with the hub site. We are releasing SharePoint Online hub sites, a new building block of the intranet. SharePoint Online hub sites bring together related sites to roll up news and activity, to simplify search, and to create cohesion with shared navigation and look-and-feel. This message is associated with Office 365 Roadmap ID: 21036. SharePoint hub sites enable you to organize your intranet by associating multiple team sites and communication sites together. This is an optional feature that has no effect on the user experience unless hub sites are created. You can use SharePoint Online hub sites in Office 365 to organize concepts, teams, divisions, or resources throughout your organization. With this feature, you will be able to create one or more hub sites by converting an existing modern team site or communication site into a hub site by using Microsoft PowerShell, or you can create a brand new modern site and start from there. After a hub site is created, admin-approved site owners can associate existing team sites and communication sites to the hub site. When this feature is made available to your organization, you will be able to convert existing sites into hub sites by using the SharePoint Online Management Shell (PowerShell for SharePoint in Office 365), and the following cmdlet: Register -SPOHubSite https://contoso.sharepoint.com/sites/Communications – (where ‘Communications’ is the existing site you would like to convert into a hub site). Complete documentation of PowerShell instructions will be published when we begin initial rollout to Targeted Release. We’ll be gradually rolling this out to Targeted Release organizations in late March and we anticipate rollout completion to all organizations by mid-May. Hi friends, its fantastic article regarding cultureand entirely defined, keep it up all the time.